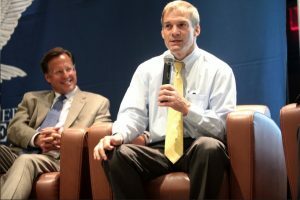 Two more former Ohio State wrestlers came forward Thursday to claim that Rep. Jim Jordan (R-OH) knew about allegations of rampant sexual abuse carried out by the team doctor while Jordan was the assistant coach, despite his denials. This brings the total up to five of Jordan’s former wrestlers accusing him of lying. According to a Thursday NBC report, Shawn Dailey says that he was groped repeatedly by team doctor Richard Strauss in the 1990s. He said that while he was too ashamed to report his experience directly to Jordan, he partook in multiple conversations with Jordan and his teammates during which Strauss’ alleged conduct was discussed.